Knowing your market can give you a strong competitive advantage. KeyWord research is about finding out what people are looking for on the internet. Using that knowledge, you can find market areas that you can compete in (niches) and then target them. It is a core part of the Search Engine Optimisation (SEO) process. There are several tools out there to help you find you what people are searching for. 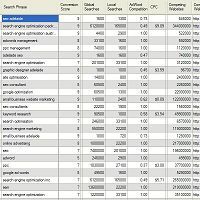 One of the most popular ones is Google's Google Ads Keyword Planner . The first thing you have to do is fill in a captcha. This is to stop people like me automating a system to gather their data. Once you have access you should first make sure it is set to the right location and language. In my case I have it set to Australia and English. To start your analysis, I would recommend that you enter your websites URL in the website box then click search. The tool will then analyse your website and return a list of suggested keywords related to it. Sorting by search volumes can help you determine which keywords are most popular. At this point I would start noting down the data. A spreadsheet would be a good place to store it. The tool provides a download option which can help speed up the process. Hopefully your own market knowledge or the results will inspire more word or phrase ideas. Enter those ideas into the Word or phrase box and perform more searches. Each time, the Google Ads Keyword Suggestion Tool will provide you with more keyword ideas. I often end up with analysing 1,000s of phrases in this way! Not all keywords are equal. Some may be more relevant to your business and therefore be far more effective than broad or irrelevant phrases. Some keywords are very good at causing sales while others attract tire kickers. You should devise a system to rate all of your keywords. I personally use a score out of 10 based on the relative chances that a phrase will result on one of my goals being achieved. This is often called the conversion rate. You can get an extra clue from the competition column. This is Advertising competition taken from Google Ads. It's generally considered that the most competitive phrases are the ones that tend to make the most profits and therefore have good conversion rates. Targeting a great keyword is no use if you don't have a cat in hells chance against all the other websites that are also targeting it. So you need to determine how competitive a keyword or phrase is when it comes to websites competing to show up in Google's Search Results. The simplest way to do this is to perform the search yourself. At the top of the search results, Google provides you with number indicating how many results it found. This is a clue on how many websites are competing for that search phrase and therefore how competitive it is. It is important to understand how competitive your website is. This will help you decide if you are going to fight it out for the richer but more competitive keywords or target the niche keywords which have less competition and still get some traffic. So how do we determine the best phrases to use? The idea is that Frequently Searched for and Relevant Phrases that have Low Competition levels will get good scores. Phrases that you should be able to target and get a piece of the traffic that they generate. As your website gets more competitive, then it will adjust its recommendations to those more competitive phrases. Hopefully this process has ended up with you having a far stronger understanding of the words and phrases people use when searching for things related to your market area. When Google is deciding which website pages to show in its search results, one of the major factor is that the chosen pages use the same words as the search phrase entered. For example, to target people searching for SEO in Adelaide you need to make sure you have a page on your website that uses that phrase. This is Keyword based Search Engine Optimisation (SEO). Using the best keywords in your Pages Titles is a good way to push those pages up further in those search results. Search phrases that stand out as very relevant with an excellent traffic potential should be included in most pages. If you do your analysis early then you can get those keywords into your domain name or even your business name. If a phrase really stood out in the analysis as a good subject you can talk about, dedicate a whole page of your website to it.